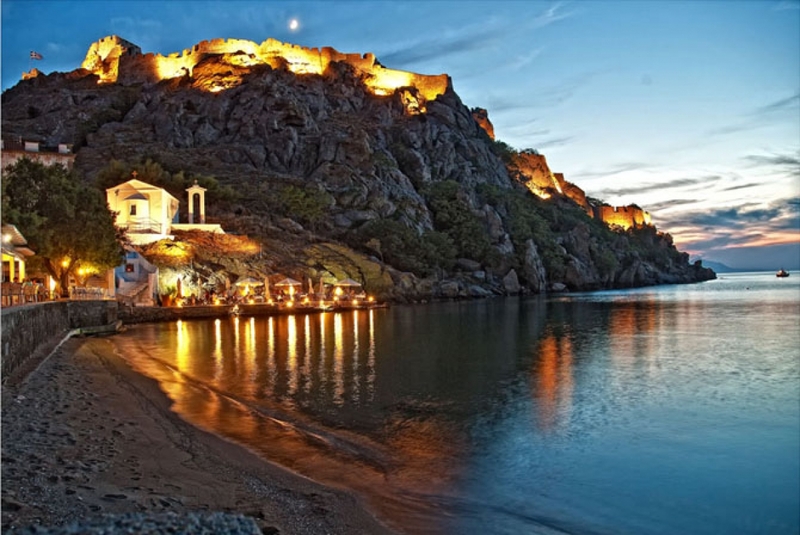 The Castle of Myrina was built in the early 12th century and was one of the strongest in the Aegean Sea. Covering an area of ? ?144 acres and the walls have a maximum height of 120 meters was built on the ruins of Pelasgian walls and materials used in the construction of the classical acropolis, he disappeared. Acquired its present form during the Venetian period. Timeless was the strongest fortress of Lemnos with triple wall, 14 towers, deep trench in the east and 150 cannons. The town itself was named Myrina Castle until 1955. In east central gate led paved path. A smaller northern gate near the coast. Inside the preserved ruins of buildings from all periods of history. In 1770, the Turks built a fortification known as "Dumbo" extant. Also survived a Turkish mosque, a vaulted underground parking, a pool and rock paintings depicting ships. The castle is open to visitors at all times. Among the rubble quite live goats and a multitudinous group of deer! It is known deer, carried out some decades ago from Rhodes, multiplied and became the new inhabitants of the castle. CHORTAROLIMNI Chortarolimni is a seasonal brackish marsh area of ? ?approximately 2,500 acres, mainly gathers rainwater from the surrounding area by creating extensive wet meadows. Summer dries up and turns into a huge pasture, highlighting the importance of the broader ecosystem for both wildlife and for the people and the local economy. Chortarolimni teaches that the harmonious coexistence of species and ecosystem protection is vital for human survival. Along with Lake Aliki and Asprolimni is the most important wetland on the island. Aliki is a lagoon area of ? ?6,300 acres associated with the sea through a small opening. It is probably the only natural salt lake this size across Europe. Between the lake and the sea there are dunes, which extend for 2 km and contribute to the infiltration of saltwater. Most months there is water in the lake, which is home to thousands of flamingos and herons, wild ducks and other migratory species or resident populations. In summer the water evaporates leaving the salt lake filled with high quality salt, while the birds leave renewing the appointment for next October. In the village Portianou a Folklore Museum, founded by the Society Portiano Lemnos Athens, Piraeus and Vicinity. Interestingly, the same building that houses the museum, sample traditional architecture of this village. On display are traditional folk costumes, tools like the loom, the spinning wheel, the Rhone, the yarns, textiles and various knitting tools. We kitchenware such as tubs, pinakotes, hundredweight and various pitchers. We also find a traditional living room, the bed with handmade dresses also covered with handmade lace, and a kitchen with traditional fireplace. Outside exposed agricultural tools that were used for similar tasks. Admission is free to the public from July 15 to September 15 daily and the remainder upon request. The Cultural Association Kontiatinon Lemnos took the initiative to organize two Balkan Painting Symposia in 1999 and 2001. Authors who participated, great names of art in the Balkans, gave their works, which then housed the amazing stone building was purchased and renovated by Kontiatinous with the support of the municipality spoon. The works on display attribute mainly to the way in which viewed Lemnos artists from Greece, Albania, Bulgaria, Montenegro, Macedonia, Romania, Serbia and Turkey. The Museum of Naval delivery sponge, where the nautical life Koutalianon both before uprooting them from the Propontis, and after their arrival in Lemnos. Visitors have the opportunity to see both heirlooms and photographs, and the divers' equipment, parts of the sponge-fishing boats, types of sponges, tools and processing machines of sponge packing. Also, the museum has the archaeological collection of New Koutali, which consists of items that the sponge fishermen collected from the depths of the sea: amphoras and other pottery, parts of ancient anchors and various small objects from ancient shipwrecks. The Archaeological Museum of Myrina housed in a neoclassical building in Romeikos shore. Visitors can follow the chronological evolution of the island, from the Chalcolithic to the Roman period, through the exhibits are accompanied by photographs of excavations, maps, explanatory signs. The ground floor presents the prehistoric Limnos with findings from Poliochni, various artifacts of Myrina, and specimens of Mycenaean pottery Koukonisi. In the same room are marble and exhibits from Lemnos and Imbros. The admiration cause a copy of Cupid, the Lyssipou and Ganymede from Trapezoforos. On the second floor, the visitor is guided through Lemnos 8th, 7th and 6th BC century. Starting from the Sanctuary of Kaveiron, with excellent bone lumen and blood vessels of the depositor. Continues to volcanoes, with grave offerings and tributes of the sanctuary of the Great Goddess. Then the visitor is guided in Myrina, the findings of the sanctuary of Artemis and sacrificed young bulls. Then we move to the classical and Hellenistic Lemnos, with vases, figurines and tableware from the graves of the Athenians. The report concludes with Lemnos Hellenistic, with exhibits from Kaveirio and potteries of Myrina and Hephaestia and inscriptions from the Roman Lemnos. A special function is performed every Easter Tuesday (Lamprotriti) in the church of Our Lady of Kakaviotissa. The church is located literally in the rock, to reach up there it follows a unique path.